Berg Furniture seems to no longer be operational. 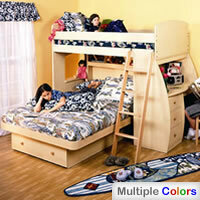 Click here for bunk beds and loft beds similar in style and quality. The Sierra collection of Space Savers was the first in line of Berg Furniture's children's bedroom furnishings, designed as an answer to space and storage issues many people are forced to deal with, such as when kids share a room or when floor space is at a premium. Available in this collection are Twin over Twin Lofts, Twin over Full Lofts and Captain's Beds, but also a selection of chests, dressers, armoires, desks, shelves and other case goods. Nearly all products from this collection feature Berg’s signature staircase with storage drawers plus abundant and practical built-in storage options. Berg is proud to offer furniture that is both designed and manufactured in the USA; constructed in the old fashioned way, as they like to accentuate, their products feature good materials, high quality hardware and excellent workmanship. 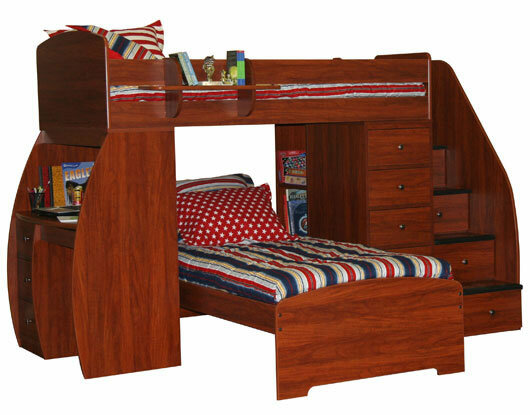 The Sierra Loft Bed comes in several different configurations: here we are reviewing one of the most popular, with staircase and student desk. However, there is also a version with ladder instead of stairs, a version without a desk, a single-bed version and several twin over full configurations. You can learn more about these by clicking on thumbnails to the right; you will be taken to each bed's respective page where you can check out its price and learn about distinctive features and differences with regard to the basic model. 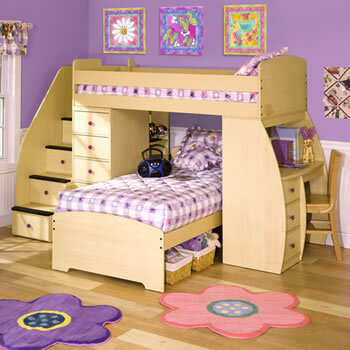 So let's see what is it that makes the Sierra Space Saver line of loft beds stand out. Design -- creative environment in childhood leads to success in later life -- there is many a research study that supports this claim. The properly designed furniture encourages and facilitates many of the behaviors that are necessary for a child to become a well-rounded, confident adult. 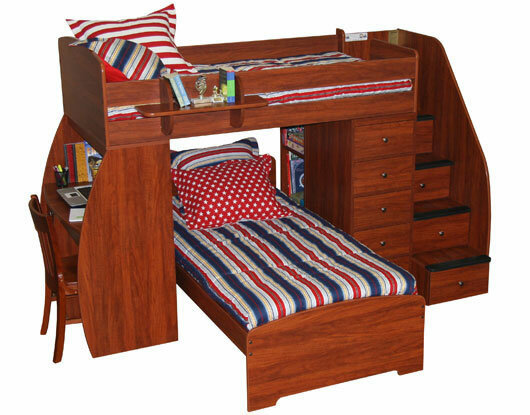 Parents are becoming increasingly aware of that fact; consequently, they have been more and more on the lookout for furniture that can satisfy these requirements -- not just any old bunkbed will do these days. Berg Furniture has been among the first to recognize the trend. The Sierra Space Saver line of products has been designed to make children feel excited and happy; to help them organize their clothes, books, toys and other stuff; to make them feel cozy and to give them a place to socialize with their peers. In short, to provide them with a great environment in which to grow-up and develop. Staircase -- Berg's signature feature, designed with safety and comfort in mind. The stairs have broad, generous stepping surfaces with non-slid treads plus a handrail, all of which allows for a comfortable and safe access to the top bed. In addition, each of the stairs provides extra storage by housing an 18" deep drawer. The staircase can be positioned at either side of the bed, allowing for greater flexibility in choosing the bed's location. 5 Drawer Chest -- drawers are 23" deep, offering tons of storage space. A special care has been devoted to their construction, the end result being 5 solid, spacious boxes sporting a finish that is both durable and easy to clean. The drawer slides are of heavy caliber metal, robust and reliable, with a mechanism preventing the drawers to fall out when fully extended. The metal drawer hardware is warranted for life. Behind the chest, accessible from the lower bed, there is an open sided bookcase, 16" x 18" in size, a nice little nook for kids to stash in books or some other treasure they like to keep close at hand. Student Desk -- the desk end of this loft features a built in fluorescent light fixture with outlet and phone jack. Three 18" deep drawers and a pencil drawer are standard equipment -- you really can't complain about a lack of storage with this setup. The attached hutch has an open back. Versatility -- as mentioned, the Sierra collection of lofts offers several different solutions to choose from. If you think stairs are dull and ladders are all the rage, choose a variant with ladders. It costs less too. You might already have a student desk and don't really care for another one -- so get a model without the desk. Don't know what to do with all that storage? The 5 drawer chest is optional also. And then there's the twin over full version: the larger lower bed offers more comfort and features another huge drawer for yet more storage space. 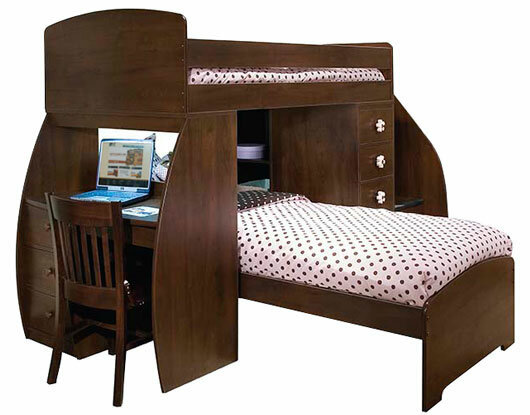 There is even a single-bed solution -- the lower bunk in this case is replaced by a student desk. Speaking of the lower bunk, an interesting thing to note is that its headboard stands on pivoting rollers which makes it very easy to pull the bed out (be it for cleaning purposes or bed making) or dislocate it completely if necessary -- perhaps because the offspring had a huge fight and decided they just can't stand to be around each other anymore. Of course, the wheels will come equally handy the next day when they've made up and the bed has to go back in. All products from Berg's Sierra collection are available in five different finishes, which makes them a good fit for the majority of surroundings. 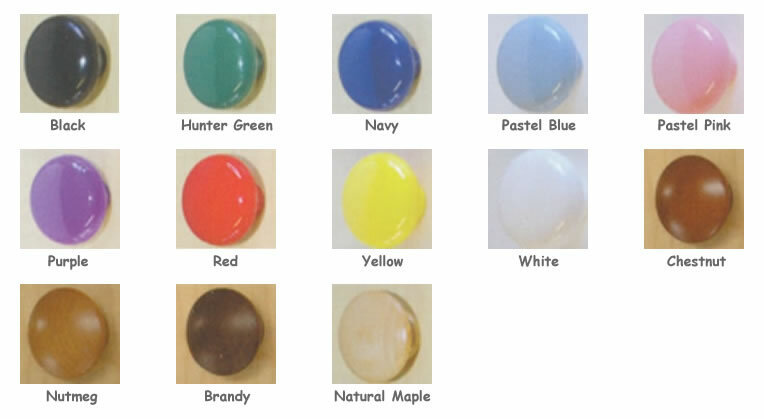 You can further personalize the appearance of Berg bunk beds by picking one of the various knob colors available. 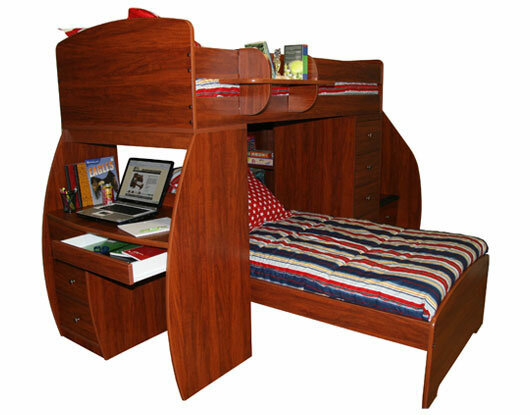 Sturdiness -- Berg bunk beds are made of high quality engineered wood designed to withstand considerable stresses their products are likely to be submitted to -- we're talking kids' furniture here, and some amount of horseplay simply must be taken into consideration. The weight limit for the top bed is set at 250 lbs -- this is a good indication of just how much confidence the company has in its product; to get a clearer picture on the issue, compare this with 150 lbs (or so) which is what many other manufacturers declare their beds are able to withstand. And finally, let's reiterate once more: Berg products are made in the USA. Not only designed in the USA, they are actually crafted by US workers at the US (New Jersey based) factory from US produced materials. You might think it odd we are directing so much attention to this fact, but: it's truly a rare thing these days, and it might matter to potential buyers who think made-in-USA products are more trustworthy. Or are simply patriotically minded. The buyers, that is, not the beds. So, what do users have to say about this bed? The following is a short review of buyers' opinions on Berg's Sierra collection. 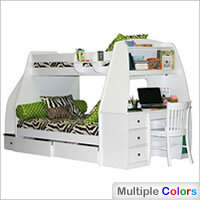 Attractive design -- you'd be hard pressed to find a buyer who does not consider the Sierra Space Saver line of loft bunk beds highly attractive. Gorgeous, beautiful, aesthetically pleasing, very unique, coolest bed ever -- these are merely some of the epithets used by reviewers to convey their impressions. The pictures in the column to the right probably don't do them justice, but they will still give you a general idea of the bed's stylishness. Click on thumbnails to have a look. Storage -- not surprisingly, it is one of top selling points of this line. The built-in drawers help maximize the available space, a feature highly appreciated by those having to deal with space-challenged living quarters. And not just them. The drawers are referred to as deep, practical, enormous. 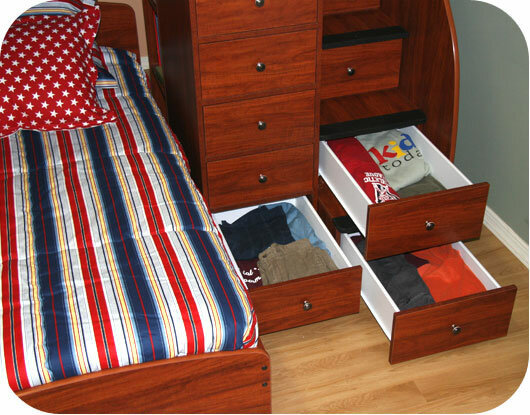 The extra storage space really helps out in a small room, note the satisfied buyers, and eliminates the need for a separate dresser. 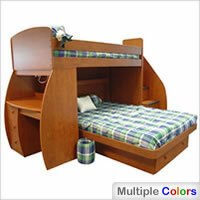 Safety -- the Sierra family of beds is considered one of the safest in the whole bunk/loft bed arena. While Space Saver lofts do not, in this particular area, rate quite as highly as the Captain's Bed line (these are simply matchless due to their low height), Berg's signature stairs with roomy stepping surfaces and non-skid treads still garner lots of safety related praise: they are touted as a safe alternative to beds with ladders and proclaimed very safe for the young ones that have to get up and down in the middle of the night -- in short, the staircase is viewed as a major safety feature. Durability -- according to the users, this is one super sturdy piece of furniture. Very durable; good quality bed; awesome piece of craftsmanship -- these are some of the epithets this product has earned from users. The bed is also quite heavy (especially the twin over full version), which, some reviewers noticed with a bit of dissatisfaction, makes it a little cumbersome to deal with. However, let's be realistic here: when bunk and loft beds are in question, heavy is good. Heavy means quality. Heavy means stability. You want your bunk bed to be heavy. And even if it does take two people to assemble it, you're only going to do it once, and it's not like you will be moving it every week, is it? We are yet to find a totally negative comment on the Sierra Space Saver line of loft beds. What complaints there are have mostly to do with the price; this is not exactly a cheap piece of furniture and some buyers admitted being seduced into spending more than they had planned -- although no one actually regretted buying it, at least not publicly. A couple of reviewers mentioned the bed turned out to be bigger in the room than expected -- mostly this is pertinent to the twin over full version -- so be sure to measure your room beforehand and check that the bed can fit in comfortably (dimensions can be found in the "features" area above). We've already mentioned about reports finding fault in the product's weight and unwieldiness; this is a fairly common remark, however, as explained above, being heavy can only be seen as a downside until the product is assembled and set into place -- afterwards this becomes an advantage. To sum it up, the Berg Sierra Space Saver loft beds are: attractively designed; comfortable; durable; they offer tons of storage and are safer to use than conventional bunk beds due to the use of staircase instead of ladder. They don't come cheap, but if you can afford to buy one, they certainly do come highly recommended.